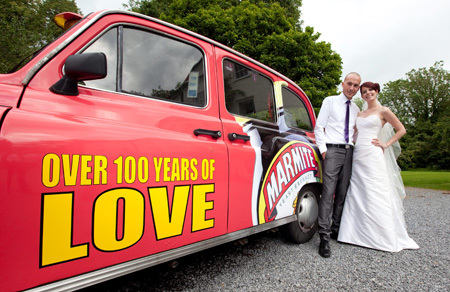 A couple shocked guests at their wedding by dedicating the ceremony to their first love – MARMITE. 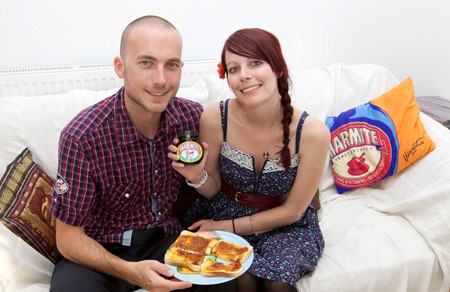 Newlyweds Terry and Jennifer Constant first set eyes on each other over a cheese and Marmite sandwich at university eight years ago. The pair have shared their passion for the spread ever since – even taking jars with them as they travelled across the world. They get through a jar of the yeast-based treat every two weeks and use it as an ingredient in all their meals – including curries. They finally got hitched at the weekend during a ceremony featuring mini jars of the food stuff for all guests and a Marmite-tiered wedding cake. Jennifer, 26, even paraded a Marmite hat. Bridegroom Terry, 30, said: ”I cannot believe I met my perfect partner, who liked Marmite as much as I did, over a Marmite sandwich. College worker Terry met Jennifer, a wedding celebrant, in the Trafalgar halls of residence at Portsmouth University, on September 28, 2003. The mature student, then studying business, went to introduce himself to the students in the flat next door to him – with a cheese and Marmite sandwich in his hand. When he knocked on the door, Jennifer, an international relations student, answered. He said: ”Within five minutes Jennifer handed me her phone and got me to speak to her mum – who was telling me how much she loved Marmite too. ”We have been inseperable ever since. 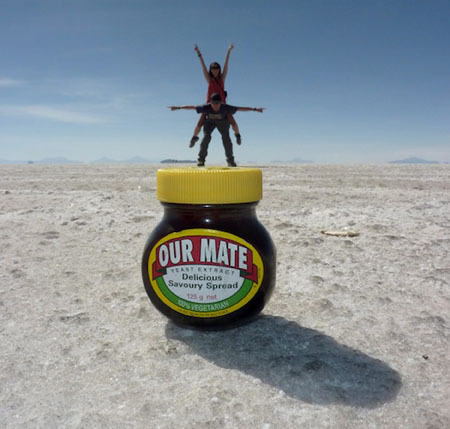 ”We bonded over how much we loved the stuff and I told her how one of my earliest memories was eating Marmite. The couple set up home in Portsmouth after university before spending two-and-a-half years travelling around the world. 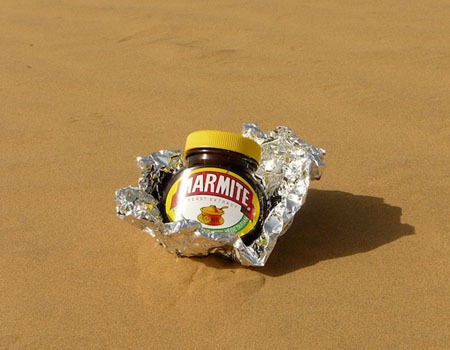 But they always took a jar of Marmite with them wherever they went – including Malaysia, Thailand, Beijing, Ecuador and Vietnam. They took pictures of the jar at famous locations, snapping it in the Indian desert, the Himalayan mountains and even at the sacred Machu Picchu Inca site in Peru. The addicted pair had to make sure they were always fully-stocked with the spread because they get through one large pot of the stuff every two weeks. True romantic Terry then proposed to his fellow Marmite-lover on a moonlit beach in Thailand on December 24, 2007 – Jennifer’s birthday. They began planning their wedding and decided that the savoury spread should be a crucial ingredient in their big day. They got hitched in front of 60 guests under a 1,000-year-old oak tree in Llangadog in the Brecon Beacons on Saturday (9/7). Terry said: ”We had lots of special Marmite touches at the wedding that, in classic style, people either loved or hated. ”I drove a Marmite taxi and we put little jars out for everyone to enjoy. About 40 of our guests said they loved it while about 15 didn’t. 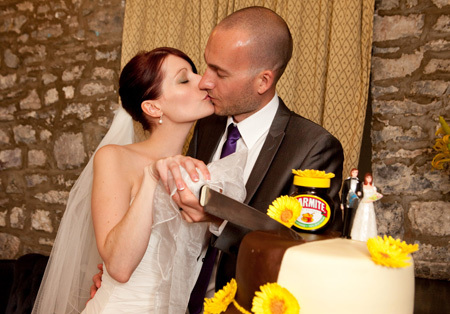 ”We had Marmite hats and of course our cake was also Marmite-themed. It was half Marmite and chocolate and half vanilla. 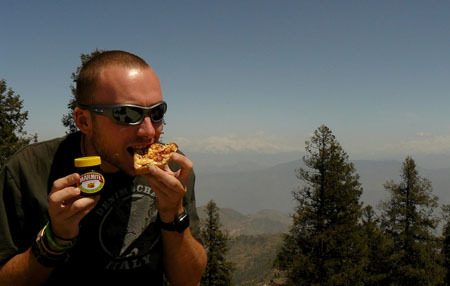 ”I was also inducted into the Marmarati – a group of about 200 enthusiasts who hold the Marmite recipe. Terry and Jennifer, who now live in Brislington, Bristol, have now left for a three-and-a-half week honeymoon in Indonesia. They will be climbing up mountains and volcanos during the high-octane trek – all with jars of Marmite rattling around in their rucksacks.